Today is my anniversary and we love to celebrate over a special dinner at a restaurant. My husband suggested French and I suggested (or strongly persuaded), Japanese. Therefore, a new Japanese restaurant that opened recently in the hip area of Yaletown became the winning choice. 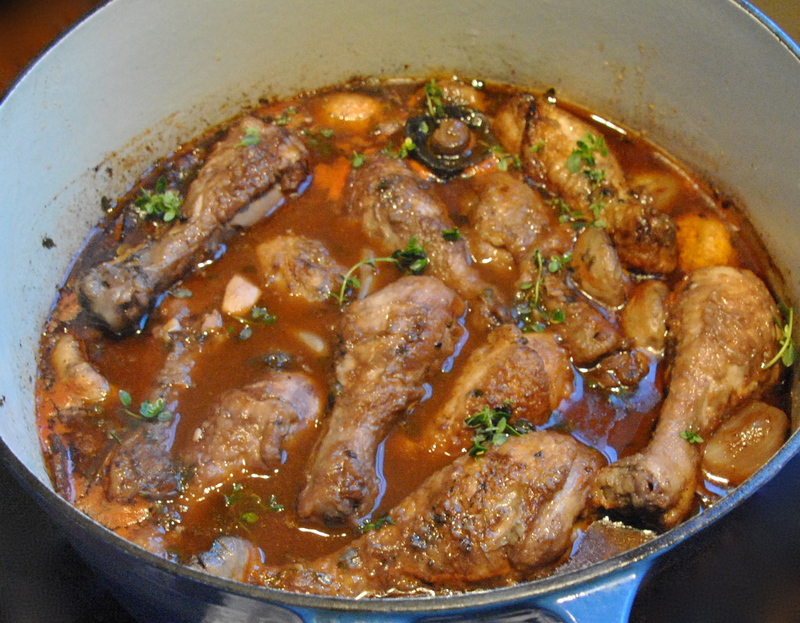 I did however want to make my husband a french dish which he loves; Coq au vin…so both of us would be truly happy on our anniversary weekend. Coq au vin, (in French translates to “rooster with wine”) is as rustic as it gets. There are many variations of the recipe since it was documented in the early 20th century. Obviously, the most important ingredients are the ‘Capon’ (rooster meat) or chicken and the wine. You can use red or white wine, I chose red! It is always essential to use top quality produce and for this dish I bought a local BC organic farm chicken and a beautiful red wine from the Okanagan valley, BC. What’s special about this Coq au vin you may ask? Well, it’s made with love of course…and the aromatics of the dish are so seductive and ambrosial. So here it is, the recipe I prefer to cook. It also freezes especially well too. 6 naturally smoked middle rindless bacon rashers (as much fat removed off side and ends as possible), cut into 4cm pieces. 1) Place the flour in a plastic bag. Season with salt and pepper. Add the chicken and shake until lightly coated. 2) Heat two tablespoons of the olive oil in a deep heavy pot over a medium heat. In batches cook the chicken, turning for five minutes or until a golden brown colour. Transfer to a plate. 3) Add the eschalots, bacon and garlic to the pot and cook, tossing, for five minutes or so until the eschalots are a golden colour. Add the wine, stock, thyme and bay leaves and bring to the boil. Add the chicken and reduce heat to low. Simmer, covered for 35 minutes or until tender. 4) Transfer chicken to a plate. Add mushrooms and tomato paste to the remaining stock mixture. Increase the heat to a medium-high and simmer uncovered, for 15 minutes or until sauce thickens. Season with salt and pepper and add brandy. Return chicken to the pan and stir to combine on a low heat for five to ten minutes. 5) Meanwhile, to make the mash, add potato to cold water in a saucepan and bring to boil cooking for approximately 25 minutes or until tender. Drain. Add the butter to the pan and return the potatoes to the pan and use a potato masher until smooth. Add the oil and milk while mashing and season with salt and pepper. 6) Arrange coq au vin on plate with mash and some extra thyme to serve. Voila! In just under three hours we drove from Grand Bend to Toronto and I have to say Google maps was spot on with the timing. We had chosen to drive back on the Civic holiday and almost everyone who we spoke with from Toronto said we were in for a long journey back; at least 4-5 hours so I guess we were lucky. 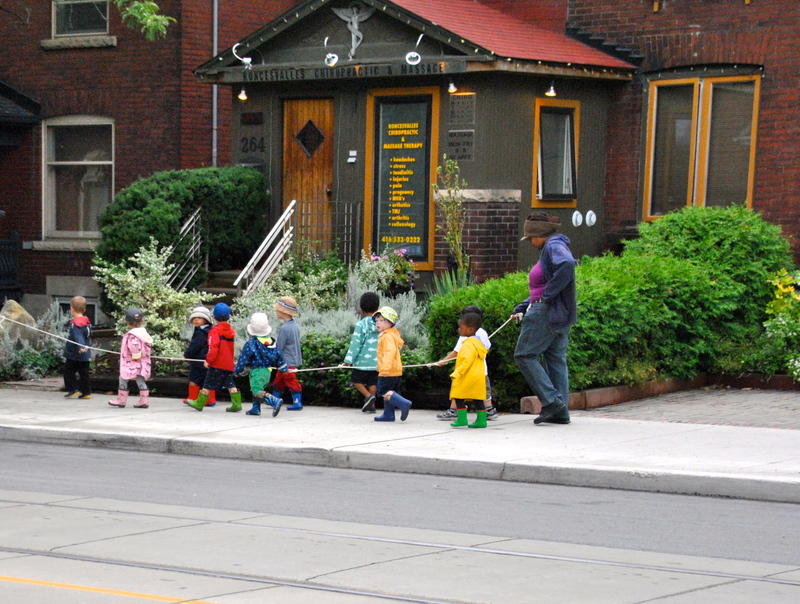 We were meeting a longtime friend in Toronto and her boys for a week in the controversially named neighbourhood of “The beaches” or “The Beach” east side of the city where she grew up and still resides. It was mid-afternoon and she greeted us in her usual style over a cool, crisp glass of white wine. 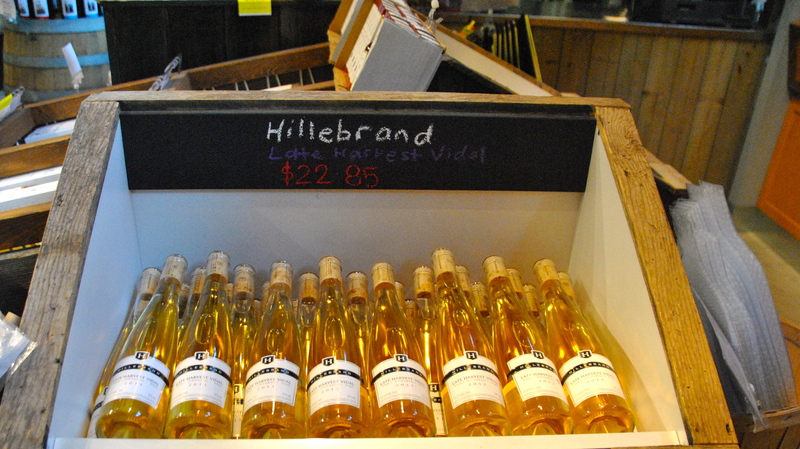 I believe it was a gewürztraminer and the first time I tasted a gewurz was four years ago with her in the Niagara on the lake area vineyards. I finally introduced my son to her sons and it was a wonderful feeling to see them unite. The boys were still on holidays so it worked out perfectly. 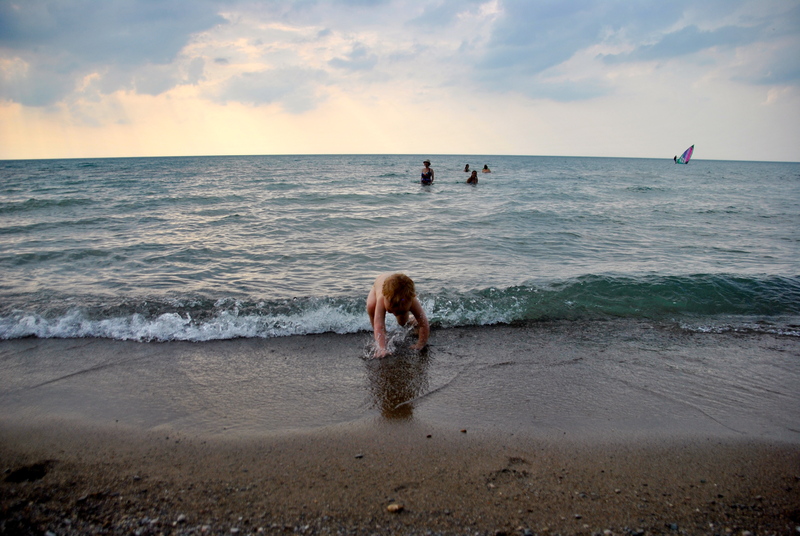 We enjoyed some beach fun, another beautiful freshwater lake beach. 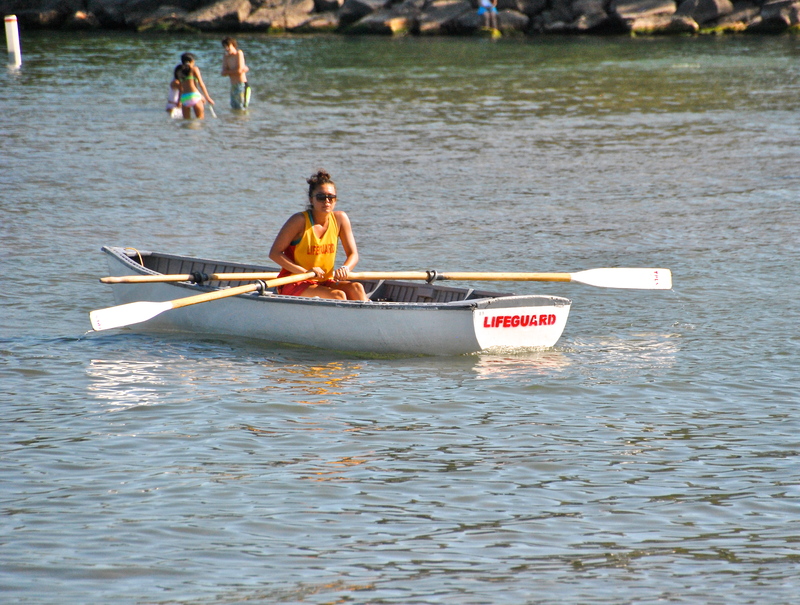 Pictured is a lifeguard from Woodbine Beach on Lake Ontario. My friend’s local cafe ‘Lazy Daisy’s’ www.lazydaisyscafe.ca located at 1515 Gerrard Street, Toronto, Ontario, became our local favourite over the course of the week. Each morning we ordered a delicious coffee which is a challenge to find anywhere in Canada, but they do exist! This homely place which has been described in reviews as ‘farmhouse chic’ reminiscent of her childhood days on her family’s farm. The menu provides a large selection of healthy options using fresh local produce and sweet treats that tasted more wholesome than naughty too. We loved the blueberry cornmeal muffin, cooked beautifully and the right size for the three of us to share a couple of bites with our coffee. We must have worked our way through a good proportion of the sandwich menu with favourites like the Coronation Chicken, Veggie Patch wrap and Farmer’s Club with mouth-watering Egli’s smoked bacon and garlic aioli which would please most I suspect. The owner has catered to kids with books, a train table, comfy seats and colouring in sheets with a wall of fame for the youngsters (if they are worthy) to put their finished art up on. 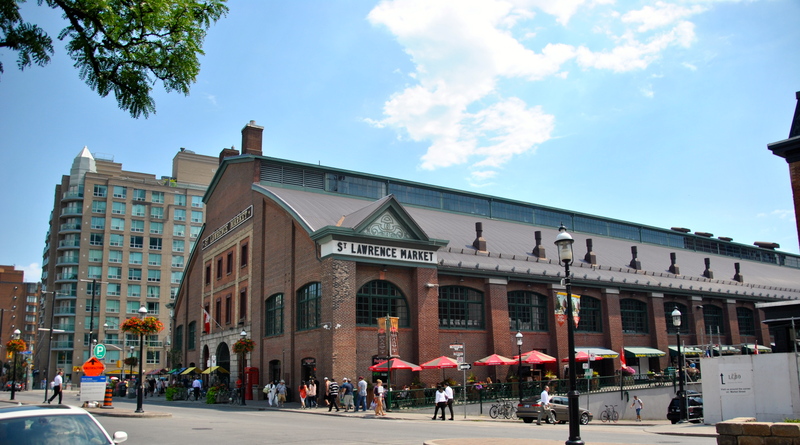 As my world revolves around delicious food much of the time, a trip to St Lawrence food markets –www.stlawrencemarket.com was in order. It is somewhat an escape from the hustle and bustle of downtown Toronto with like-minded people gazing at the endless treasure trove…a foodie’s heaven. 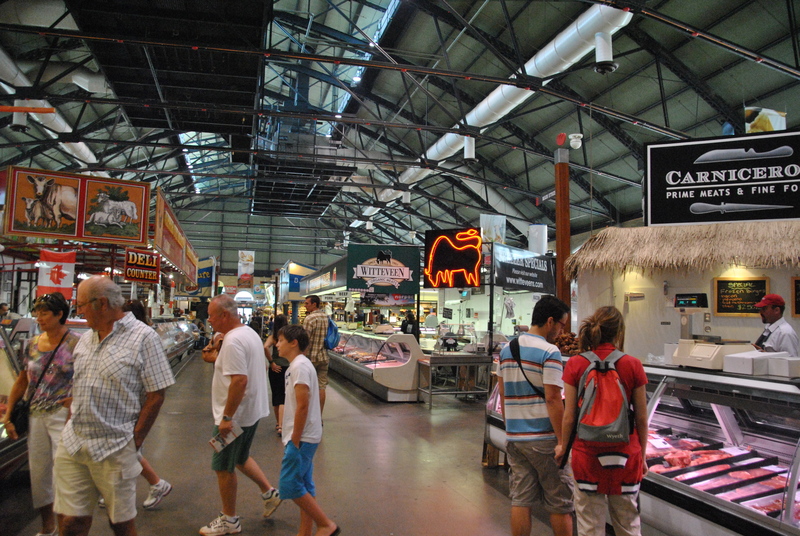 The number of food markets I have visited on my travels has really clocked up over the years. I would have to say that this one was serendipitous. There were so many specialty ingredients and produce items you could source in the realms of this grand building. 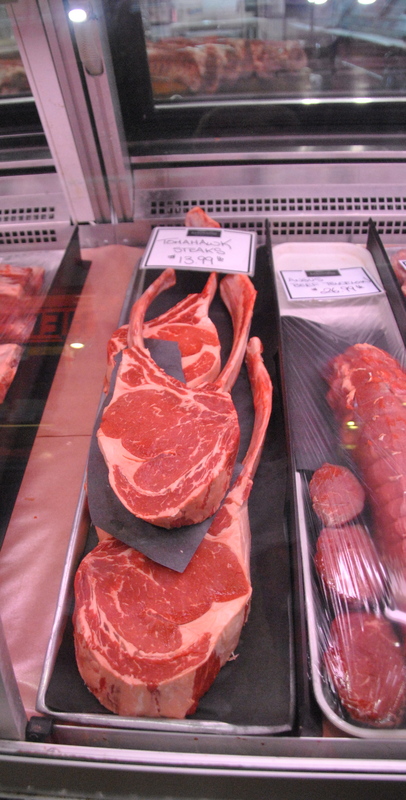 The selection of smoked meats, cheeses from around the world, seafood, wines, produce, ice-wines, truffled products, rainbow coloured pasta, tomahawk steaks from Alberta, baked goods galore was mind-blowing. It hardly does it justice, but I guarantee it is a must do, must see for yourself experience! After wearing ourselves out in the market, my friend took us to a restaurant she knew well from trips with her parents as a child. An institution which has been running for over a quarter of a century; Paddington’s Pump – St Lawrence Market, 93 Front Street E, Toronto sure packs a punch with its ‘Oink on a Kaiser’. It is the most bacon I have ever seen on a bun! Ok, so moving on…I must note that the days have passed where I used to spend hours shopping in gorgeous boutiques and finishing with a good wine while taking great pleasure in my purchases. I am lucky these days if I can enjoy one or two stores at a time with a little boy in tow, but a girl can fantasize right? 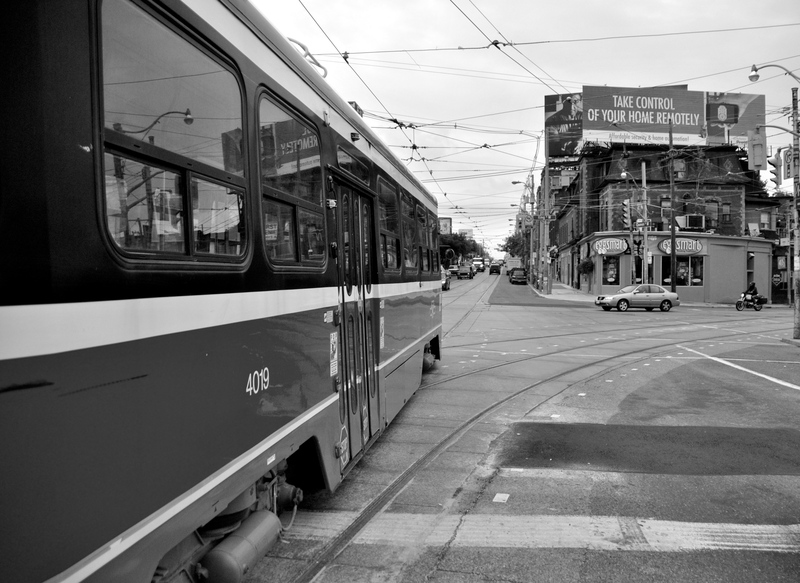 A streetcar ride up Queen Street and I had to ask my girlfriend what area we were in at some point; she said ‘Queen West’, only one of Toronto’s coolest neighbourhoods and shopping districts. I so wanted to jump off right there and then and while away the hours with all my favourite things; fashion, art-design, patisserie and wine. Before I could think about it a moment longer we were somewhere else, however this is moving to the top of my list next time I visit Toronto. 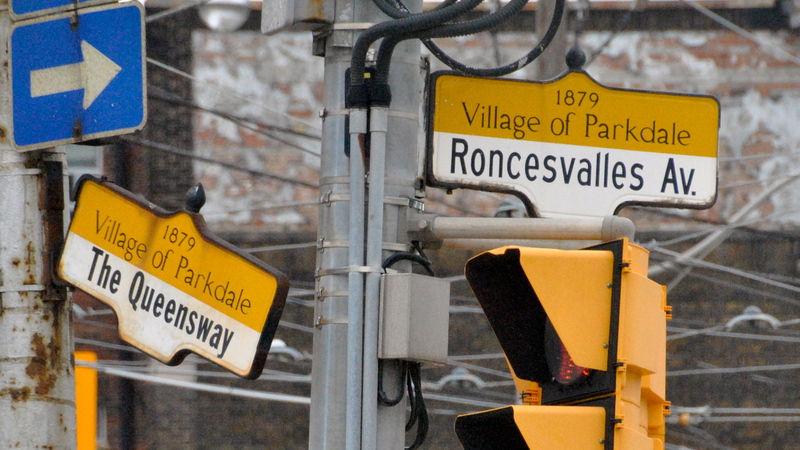 An area we spent time in together was a good compromise as I was able to step into some unique stores where there was something for everyone in Roncesvalles Village which is an area located east of High Park and north of Lake Ontario. Toronto is one of the most culturally diverse cities in the world and this part of the city is better known as the Polish community’s centre. 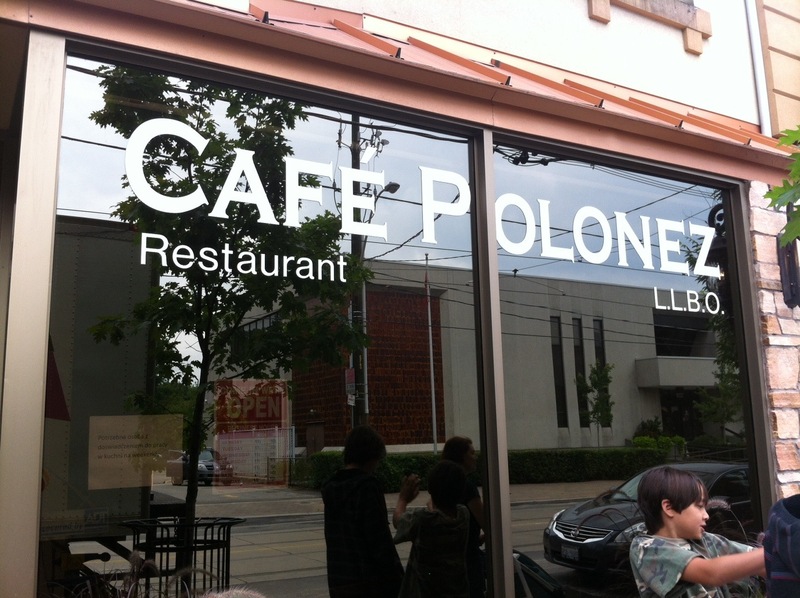 We were funnily enough heading to lunch at Cafe Polonez – 195 Roncesvalles Ave, Toronto. Traditional Beetroot soup with dumplings (Barszcz czerwony z uszkami), which is Borscht consommé with a choice of mushroom or meat dumplings. Pierogies (rozne nadzienia), homemade boiled dumplings served with side of sour cream and fried onions & pork; we chose the sauerkraut and mushroom, minced pork, cheddar and potato ones. Polish Schnitzel (kotlet schabowy), plain cutlet served with potatoes and a bouquet of salads. If I had the stomach the size of four people, I would’ve also ordered the cabbage rolls (golabki), polish sausage (kielbasa z frykami) and Goulash (gulasz wieprzowy) too! How does the Polish proverb go? “A good appetite needs no sauce”. My friend and her boys are so fortunate they have a wide selection of top quality Polish food on their doorstep and this is the advantage of living in a city steeped with multiple cultures and heritage. We girls had to have a night out together to catch up. My friend booked tickets to see The Temper Trap in concert who were touring in Toronto coincidentally when we were there. They are an Australian band and had global success after releasing ‘Sweet Disposition’ which played at my wedding so it’s pretty special. The concert venue was the ‘Kool Haus’ in the Guvernment Entertainment Complex – 132 Queens Quay East, Toronto. It was a really cool space and relaxed enough for us to enjoy our vodkas and catch up over some music from home. Dinner beforehand was a few minutes away from the venue at Against the Grain Urban Tavern – 25 Dockside Drive. When I spotted the Hendrick’s Gin that put a smile on my face and we tried the barman’s cocktail with a rosemary infused sugar syrup in it which took it to a new level for me! We ordered the fish ceviche soft tacos which were amazingly good. We were seated right on the harbour front which gave me a taste for more seafood so we both chose the Urban lobster roll with a cold glass of Niagara riesling. I am not sure if I am saving the best till last, because the entire week was special seeing my girlfriend and her boys. However, when we were offered a date night; that is my husband and I, we jumped at the chance and booked a restaurant she recommended from a choice of a few. Given I am reading the 100 Mile Diet at present, I wanted to dine at a restaurant that focuses on locally sourced produce and more importantly we were enthusiastic to try Caribou, Elk or something that may be a rarer find on the West Coast. 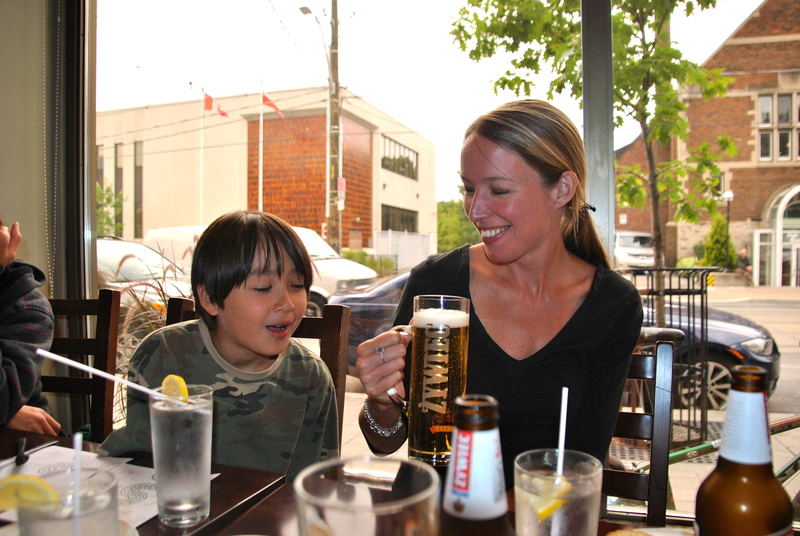 We dined at Globe Bistro – www.globebistro.com 124 Danforth Avenue, Toronto. To our delight, we were fortunate to enjoy the taste of Elk (a first for us) along with a duck dish, a selection of freshly shucked Malpeque (Prince Edward Island) oysters and a host of freshly picked ingredients from Ontario’s best farms on each plate. The restaurant had soft lighting with elegant chic furnishings as well as a friendly and discreet waiter who seemed to only appear with a smile whenever we needed anything leaving us to immerse ourselves in the ambient vibe. I know my pattern of storytelling often skews towards food, but all in all the week was about seeing a very dear friend and her family at home in Toronto, meeting friends and family members. It was a memorable time and I will miss them…until next trip of course! 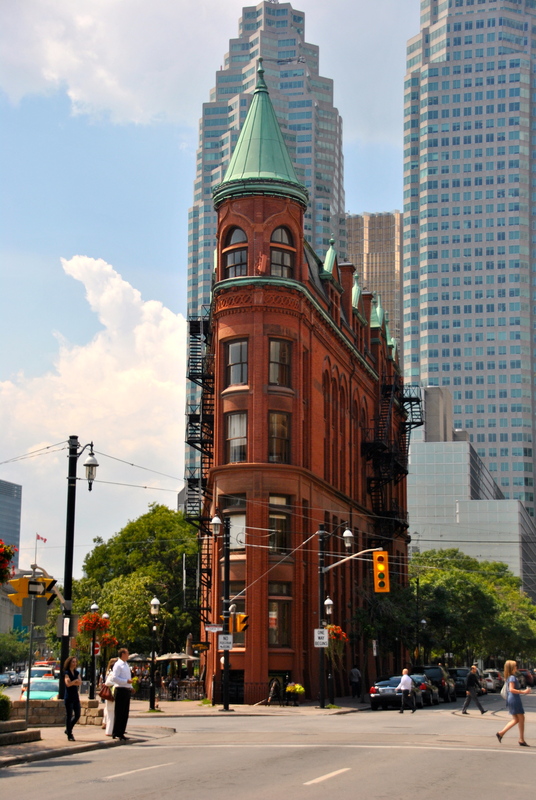 “Flatiron Building” – Historic landmark of Toronto, Ontario, Canada. I am not sure where to start. This has been the longest period between writing about our adventures and I have wanted to log in for over a week now to record it. So I will go back to the beginning of our vacation which took off in early August flying to Toronto, Ontario. Immediately we arranged our hire car pick up and drove to Guelph, a university city in Southwestern Ontario, Canada. 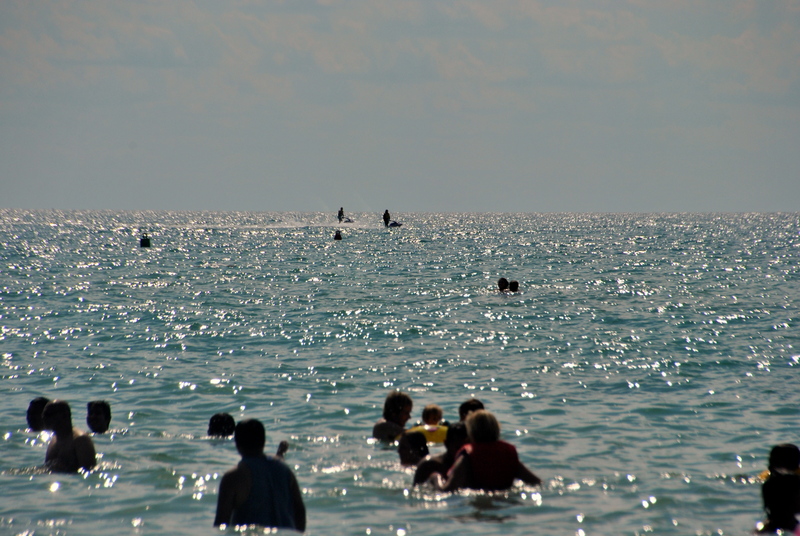 It was just under an hour’s drive from Toronto Pearson International Airport. Although it was a brief stay overnight to break up our journey to Grand Bend which is approximately three hours away, we found it to be a charming town. There are many heritage buildings and distinctive limestone architecture is evident all over particularly in the downtown area of the city. Guelph is steeped in history. With a nickname of ‘The Royal City’, according to Wikipedia; [the name Guelph comes from the Italian Guelfo and the Bavarian-Germanic Welf. It is a reference to King George IV, monarch at the time of its founding (who family was a family from the House of Hanover, a younger branch of the House of Welf) and a tongue in cheek reference to the then ascendant population in neighbouring Berlin (Kitchener). (Guelphs being the name given the northern Italian factions who opposed the reign of the Holy Roman Empire]. Guelph is the home to one of Canada’s largest breweries; Sleeman Breweries Ltd. Its headquarters were founded here in 1834. This fact is particularly important as my husband is working his way around the country trying and buying the best of what’s on offer in that department. We booked into a bed & breakfast called the Norfolk Guest House located at 102 Eramosa Road, Guelph. It is a little pricey at the upmarket end of where B&B’s sit, however we wanted to assure maximum rest and comfort after a long flight and drive. With a glorious plush bed, double Jacuzzi tub and elegant furnishings in a large grand room we were aptly satisfied. On arrival we were greeted to a generous charcuterie and cheese plate with a bottle of red (which was pre-ordered) and we were happy. As a final unwind before hopping into bed, we enjoyed a luxury bath overflowing with bubbles, jets and soft hues of colour from lights under water. Our son found this thoroughly entertaining! Breakfast was served in an ornate room with high ceilings and decorative fixtures. We were happy with our orders of eggs, french toast and fruit which was lovely. The only disappointment for us was the lack of warmth and hospitality from the host. My preference for bed & breakfast establishments over large chain hotels is always first and foremost for the personal service you expect. The extra touch of a friendly more intimate stay where you are introduced on a first name basis, learn more about where you are staying and the history of the location ensures a pleasant experience overall. Sadly, this was not the case but oddly enough I couldn’t flaw anything else. 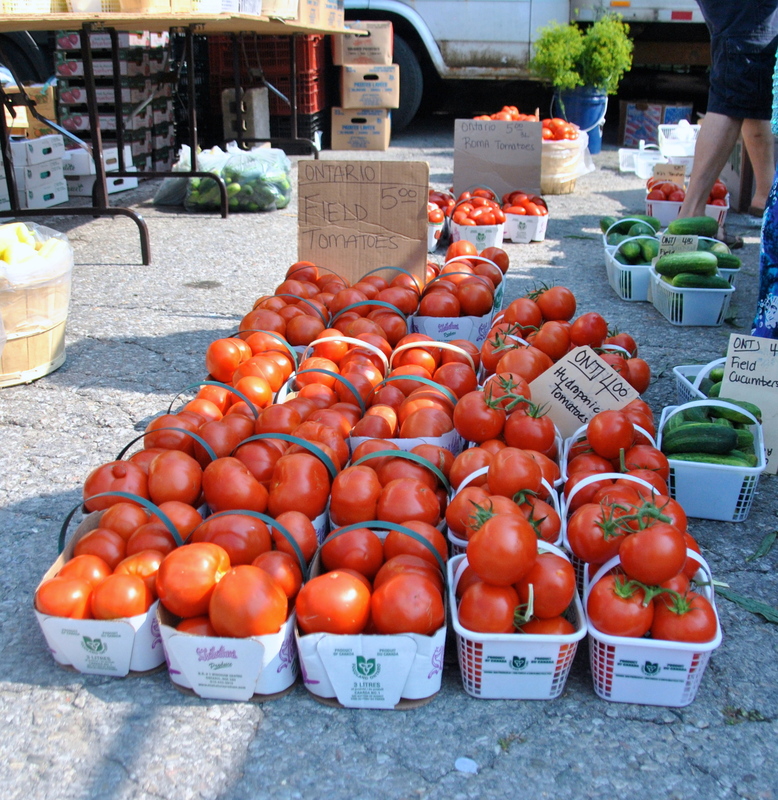 Before leaving the town, we visited the Guelph Farmers’ Market located at 2 Gordon Street (corner of Gordon Street and Waterloo Avenue). 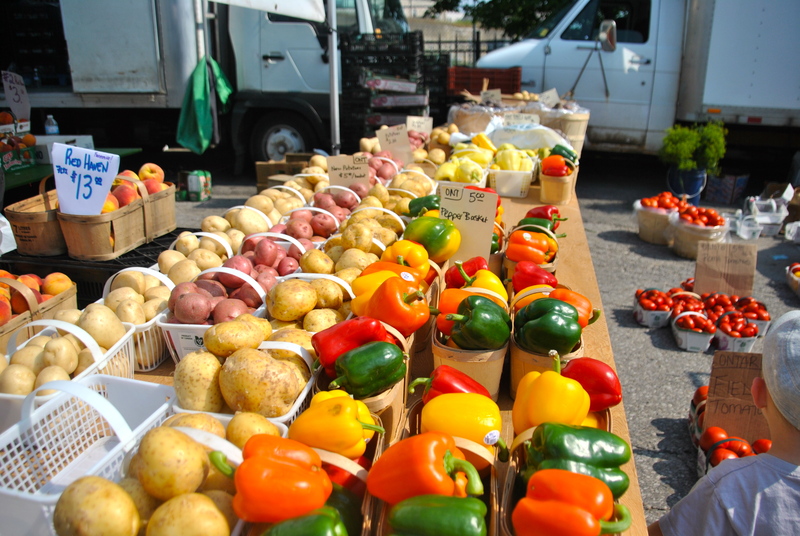 The markets are on Saturdays 7:00am to 12:00 noon (Year Round) and Wednesdays 3:00pm to 7:00pm (June 20th to October 31st only). At 9am it was a hive of activity with locals out in full force and with over fifty vendors, these markets were plentiful; no fear in produce being scarce two hours after opening! 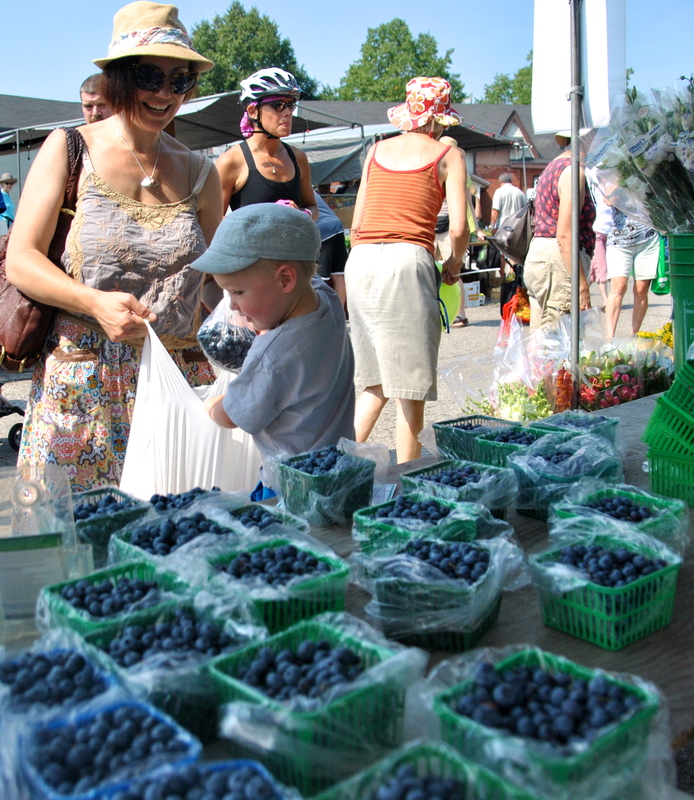 Summer fruits were a delight, especially the peaches, watermelon and blueberries. 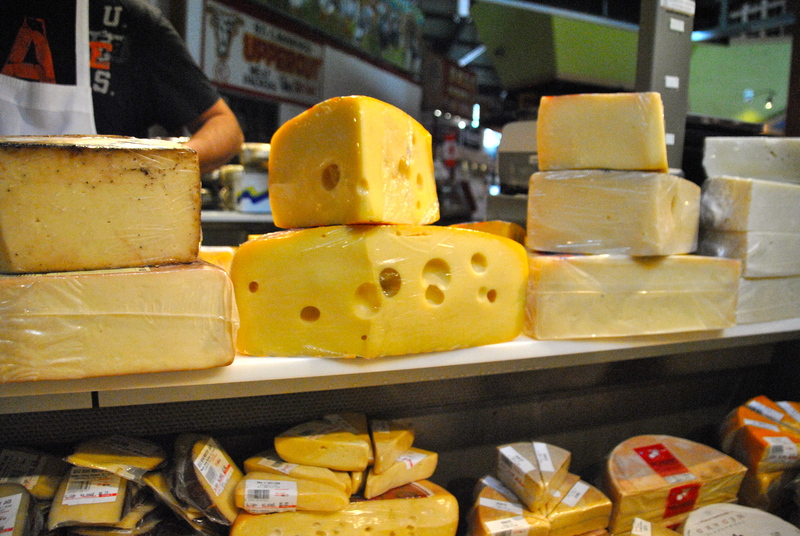 There was a huge variety of vegetables, dairy, meat and specialty foods – we were in heaven. By 11am it was an extremely hot 31 degrees celsius, so unfortunately we could not indulge in perishables for our long trip and there it was, we departed salivating like Pavlov’s dog. Guelph appears to have a full calendar of events taking place and we arrived on 4 August which surprisingly was Guelph’s Annual John Galt Day (in celebration of the founder of Guelph). This was held at the City Hall & John Galt Park. While we were enjoying the sounds of the music and entertainment kicking off, we wandered over to the Cornerstone Restaurant/Cafe at 1 Wyndham Street North, Guelph. Although we stopped in for coffee only, it has a laid back pub-like feel and serves vegetarian food. Breakfast sounded good with options like cornmeal waffles with blueberry compote and I’ve heard the African Bean Stew and the Corner Club sandwich are a reasonably good pick for lunch too. Our coffee was just how I like it, hot and not too strong. It did the job and picked me up for a good part of the journey to Grand Bend. 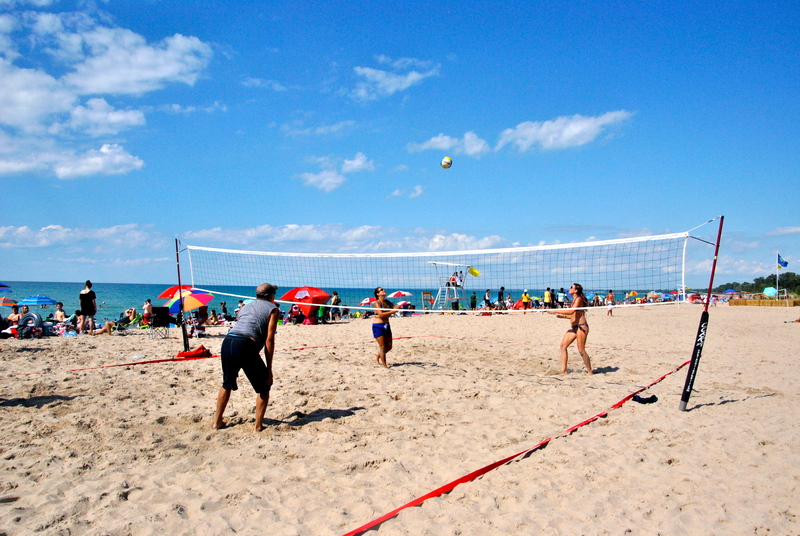 We were meeting friends and their family at Grand Bend and staying with them in a cottage. 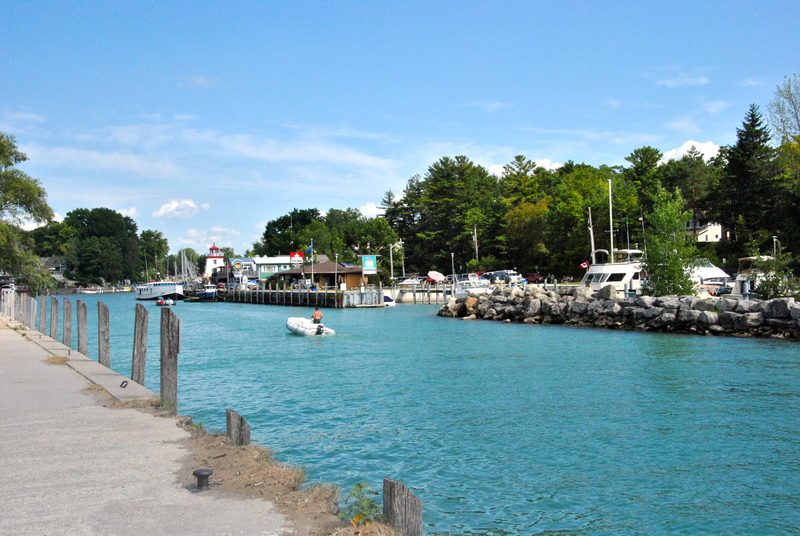 Grand Bend is located on Lake Huron, one of the five Great Lakes in North America. 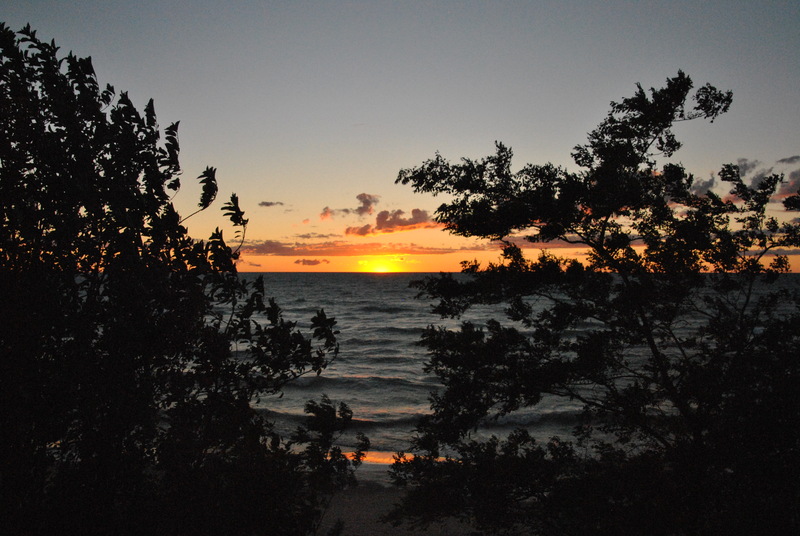 Lake Huron has a surface area of 23,000 square miles making it the third largest fresh-water lake on Earth. A Torontonian friend who now resides in Vancouver told us before we left that it was a ‘party town’. I laughed as I thought it couldn’t possibly be when I knew we were visiting friends with their children and families staying in a quaint holiday cottage to have some peaceful beach time. On arrival it did appear that way; quiet, relaxed and beach around the corner which was by no means packed on any occasions we were there. However, I understood what he meant when we took a drive on our way out one afternoon on Main Street and witnessed for myself that this lazy beach town which is populated with a few thousand inhabitants most of the year round, actually increases to approximately 100,000 in the summertime. Whoa was it busy! We enjoyed a dinner out at the Growlin Gator Bar & Grill – 86 Main Street, Grand Bend, Ontario, Canada. With a pumping vibe so close to the main beach, we were lucky to get a good table in the courtyard. With an extensive cocktail and martini list and kid’s menu, which I thought was a good combination – everybody was happy. Service was friendly, food came quickly and although taste wise it was average, kid’s were happy and that is the most important aspect of going out with multiple families! The beach was the closest reminder of home with soft white/yellow fine sand, and had familiar bushy green foliage surrounding it and similar outlook to the bay where I would spend my summer holidays growing up on the south coast of NSW. The water was even warmer than any water we’d experienced in Vancouver. I had to keep reminding myself that it was a lake not an ocean so each time I would enter, it was a little odd to taste fresh, clear water as opposed to saltwater which I expected. 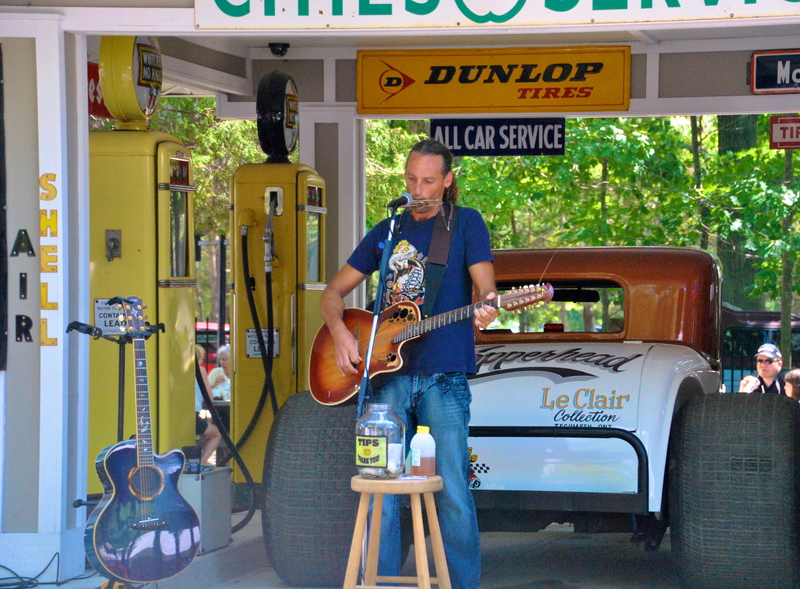 As a final stop, we visited the Grand Bend Pinery Antique Flea market – 10163 Lakeshore Road, Grand Bend. 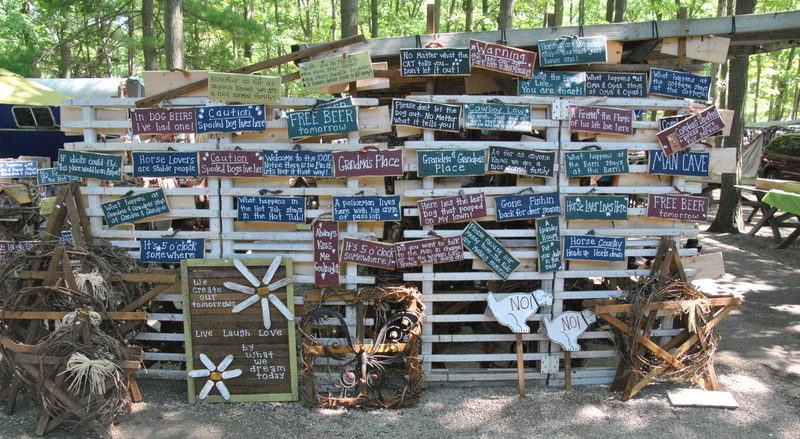 It is open May through November and was full to the brim with stalls of food, poutine, bric-a-brac, new homewares, toys, antiques and more. Entertainment was very impressive too in the beer garden area. You need to allow at least a couple of hours as these markets are huge. We had a restful beach holiday with relaxed fun company as you would expect. To finish I think the pictures speak for themselves and although it’s clearly not a hidden secret, I recommend this place to anyone visiting the glorious Lake Huron and seeking out a beach holiday in the Ontario province. After our steamy affair with ‘Steam Rollers Burritos’ the other week, I couldn’t stop thinking about the speed in which they delivered it to us and more importantly how delicious it was. 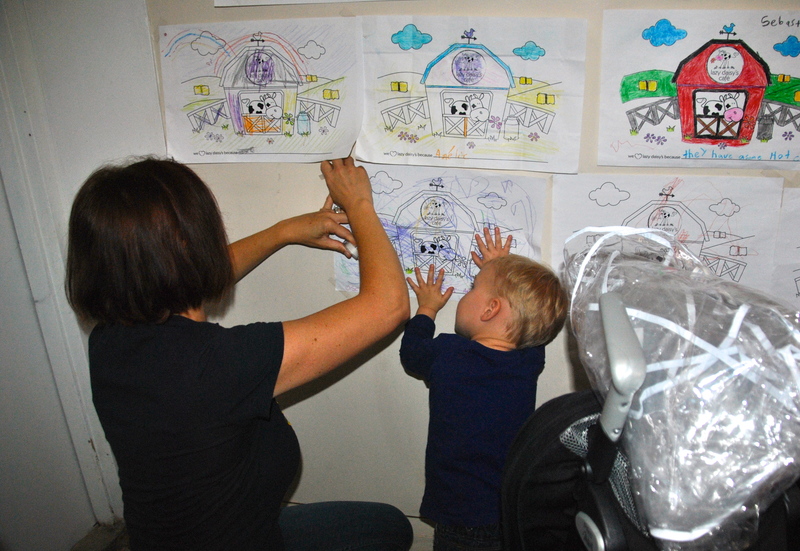 We all enjoyed it, and when I find something outside of my repertoire that our son likes then I must reproduce it somehow! Ok, so I’m not sure about the steaming process but I certainly am going to try to come up with a similar flavour profile! 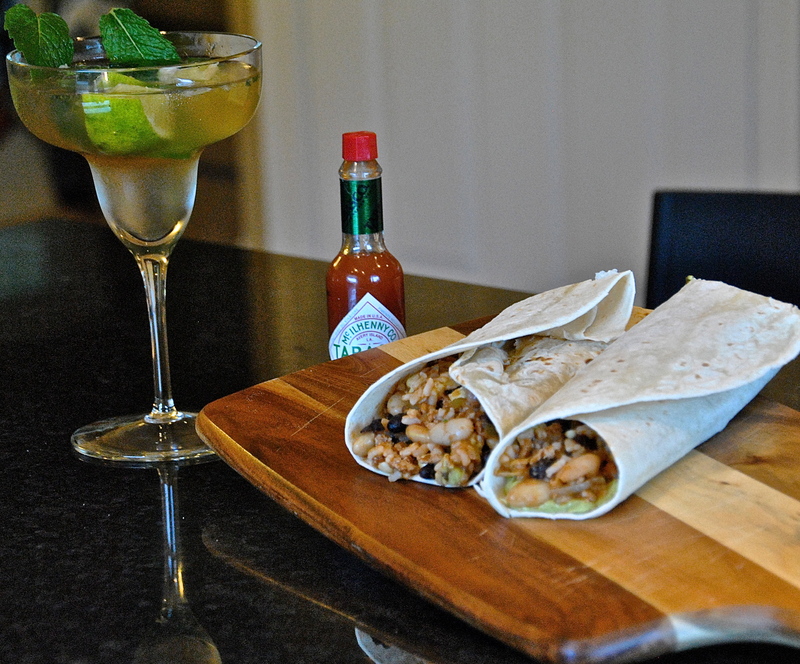 On a lazy summer weekend, these burritos are fairly easy and great for a late-afternoon/early dinner when you have friends around with children too. We are virtually flexitarians; those who mostly keep to a vegetarian diet, but will eat meat occasionally, and for this experiment I have used some turkey mince which is a lean addition to what could also be a vegetarian option with the protein packed beans. I chose cannellini because they have a creamier texture (for my son), and black beans for good contrast too. I don’t think there are any rules for burritos and if there are…well I’m not Mexican! The main goal here is that the whole family enjoy them. I think my burrito wrapping skills leave a bit to be desired though. 400gm mixed beans from a can (I used cannellini and black beans) rinsed and drained. 1 brown onion finely chopped and diced. Optional extras: 1 cup fresh cilantro/coriander leaves (finely chopped) and Tabasco sauce. 1. Use a small sharp knife to cut down the length of the corn cobs, close to the core, to remove the kernels. Cook corn kernels in a small saucepan of salted boiling water for 3-4 minutes. Refresh under cold water. Drain. 2. In a deep-frying pan, warm oil on medium heat. Cook turkey mince with taco seasoning until browned and set aside in bowl. 3. On a medium to high heat, add onion and peppers to frying pan until soft and add beans, salt, thyme, parsley, chilli, lime zest, turkey mince, stock and tomato puree and stir for 5 minutes to combine. Turn down to a simmer for approximately 25 minutes or until almost all liquid has absorbed. Turn off heat. 4. Cook rice in a saucepan of boiling, salted water, following packet directions, until tender. Drain. Refresh under cold water. Drain and set aside. 5. Meanwhile, mash avocado, adding lime juice and then sour cream. 6. In a big bowl, combine the rice, corn, turkey and bean mix. 7. Warm tortillas in microwave or according to packet instructions (they are easier to wrap this way). With each tortilla, spread a little of the avocado mix and sprinkle with cheese in a rectangular ‘I’ shape leaving the bottom third of the tortilla free. 8. Finally place a couple of tablespoons of the rice mixture on top, with extras like Tabasco and coriander if you like and wrap. (Please note, I find the best way to wrap a burrito is by following the steps below). 9. How to wrap burrito: > Fold the bottom third free flap over > Carefully wrap the left side over the filling > Create a small diagonal flap with the remaining side of the tortilla at a 30-35 degree angle > Bring the right side of the flap over filling tightly and it’s ready to go! A cocktail or two for ‘the parents’ works well too – Enjoy! A grouse salad recipe for the Grouse Grind! Grouse, means by definition a mumble, mutter, complain pettily. However in our ‘Aussie slang’ it means awesome! So given this evening my husband is about to step up to the challenge of the Grouse Grind, I thought I better make a grouse aka awesome salad for dinner which would not only be satisfying and full of flavour but high in protein too. I have included the recipe below. The Grouse Grind is a 2.9-kilometre trail up the face of Grouse Mountain, commonly referred to as “Mother Nature’s Stairmaster” except you are on it for about 1.5-2 hours! (Sourced from www.grousemountain.com). It is located in the North Shore region of Vancouver, you stay right on the Capilano road over the Lion’s Gate Bridge from Downtown Vancouver. The first hikers recorded on the mountain was in 1894 when a hunting party shot a blue grouse bird and named the mountain in the bird’s honour. It wasn’t until the 1920’s and early 30’s that it became a popular spot for adventurous hikers. It is a steep climb with rugged terrain up an approximate 56 percent slope (30°) which starts at the Valley Station of Grouse Mountain and finishes at the Peak’s plateau. This is a boy’s night out for my husband as he and a mate will be doing the evening hike after a day’s work, so I’m not sure what the motivation is; the excellent aerobic fitness workout or soaking up the view with a beer up top! Atop the mountain, there are plenty of activities to do and I will talk about that next in my following post as I experienced it ‘without’ the stairmaster workout with my son, girlfriend and her children arriving by gondola which was one of the best days ever since arriving in Vancouver. Ok, so here’s the salad I have made for dinner…it is not one of my own creations but I think this will do the trick to get my husband comfortably to the peak with loads of energy minus the sluggish feeling. One of the food magazines I worked on in Australia called Good Taste published this fabulous recipe in the January issue, 2010 which is right in the middle of summer so it’s very suitable right now that we are starting to get the warmer temperatures here in Vancouver. 1. Combine water and quinoa in a large saucepan over medium-high heat. Bring to the boil. Reduce heat to low. Cover and simmer for 12-15 minutes or until the liquid is absorbed. Transfer to a large bowl. Set aside to cool. 2. Meanwhile, preheat a large chargrill on high. Spray lightly with olive oil. Cook the asparagus for 2-3 minutes or until tender and crisp. 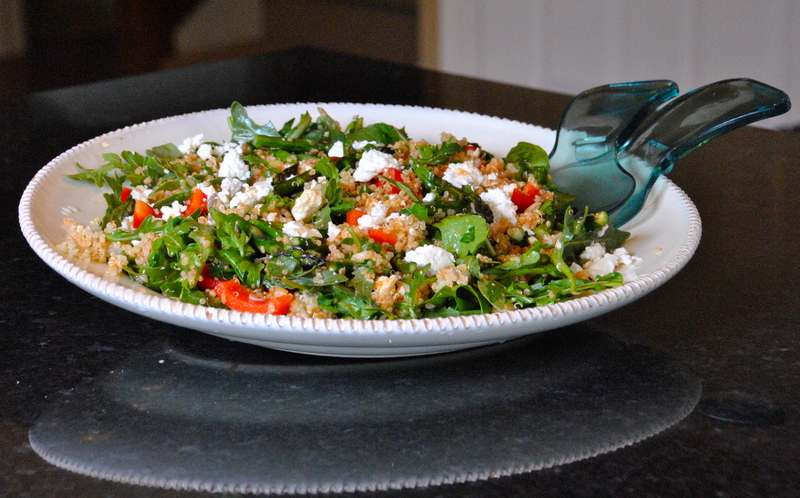 Add the asparagus, capsicum, feta, sunflower seed kernels, shallot and parsley to the quinoa. 3. Whisk the lemon juice, honey, oil and paprika in a small bowl until well combined. Add the dressing and rocket (arugula) to the quinoa mixture. Season with pepper and toss to combine. There you have it, a ‘Grouse’ aka awesome highly nutritious protein packed dinner – Enjoy! 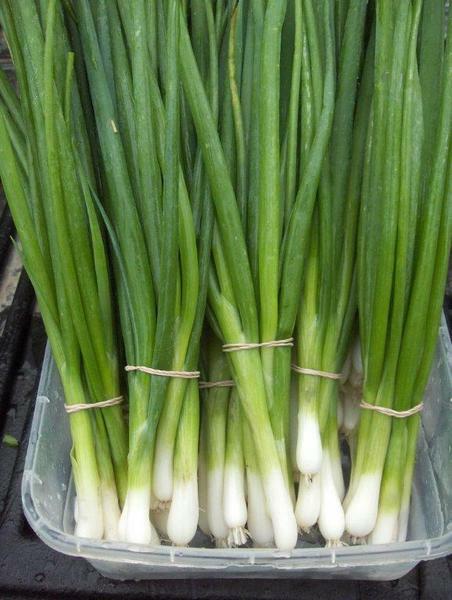 Please note: Image of shallots which could be termed white onions in Canada. So it has been a long week, or couple of weeks I should say. On the good side there has been birthday celebrations, Father’s Day and more cars free day festivals. On the not so good side there has been the physically exhausting exercise of moving house. Ok, although we were only moving up two floors in the same building, I soon realised you can accumulate quite a few items in three months! So I apologise especially to family and friends for not keeping you in the loop with our adventures, but finding some focused minutes or hours in the day to write has been a challenge…anyway back on track now. When even making dinner sometimes is perhaps one of the last things I want to do after all I’ve packed into a day, this meal is easy to prepare and my go to dish takes minutes to prepare. Before you know it you are sitting down to a satisfying meal and a cold crisp glass of wine! My hump day pasta dish (serves 4). This recipe has been a favourite of mine for years. It is particularly good I feel when I am craving comfort food. Surprisingly my son likes it as well, perhaps he is a salt fiend too. This is inspired by the rustic Roman dishes I enjoyed while travelling around Italy (on a shoestring budget) in my early 20s. Broccoli is the hero here for green goodness! 1 medium head of broccoli cut into small florets, (I like using the centre of stalks sliced too). 1/2 cup of roasted breadcrumbs (can make a day ahead – takes 3-5 minutes under grill). 1 Tablespoon of balsamic vinegar, preferably a high quality aged one as it is less acidic and has a more caramelised flavour. 1. Place spaghetti into a large pot of boiling salted water on high heat. In the last four minutes throw in broccoli florets. 2. In a medium frypan, heat 2 tablespoons of EVOO (not cold pressed) and crushed garlic cloves on a medium heat. You do not want to brown the garlic, just heat for 1-2 minutes till fragrant. Add anchovies, capers and chilli for another minute or two. 3. Add balsamic vinegar, and you should see a slightly thicker caramelised consistency. 4. Mix in the breadcrumbs for another minute or so on heat and remove. 5. 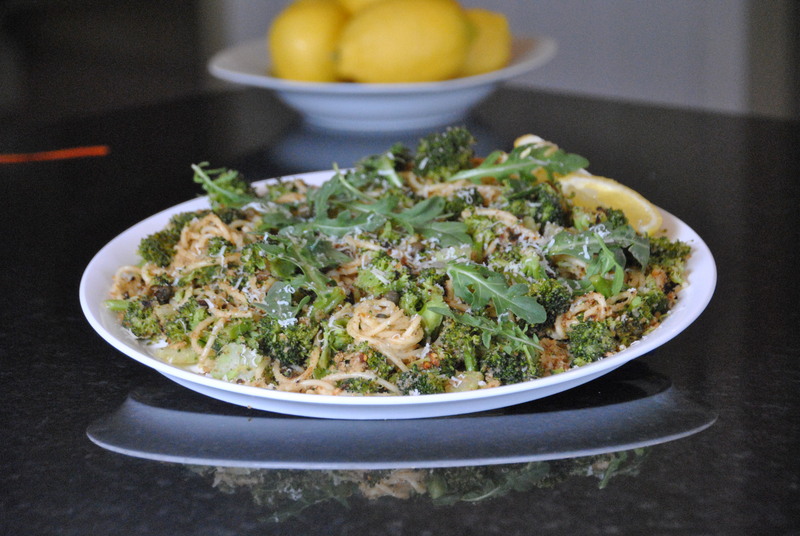 Drain your pasta, then in the same pot you boiled the pasta, use premium extra virgin olive oil to coat bottom and toss spaghetti, broccoli, breadcrumb mixture and lemon juice together. 6. Add rocket leaves or parsley for extra texture, pecorino and black pepper and serve. Pour your glass of wine and enjoy! hadn’t changed much appearance wise following my first visit in 2008. 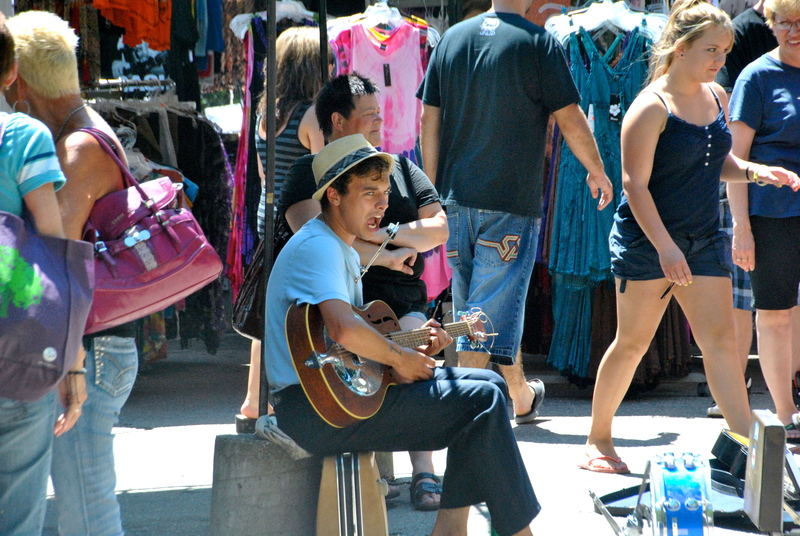 It is located on a “character strip” of Beatty Street, Crosstown which is between Yaletown and Gastown. The interior has a stylish industrial feel of exposed brick and piping juxtaposed by the elegance of chic lighting, splashes of red and chocolate leather seating with wooden tables. This time around I was delighted to learn that Chambar became a carbon neutral restaurant in 2011. The menu is an ‘Ocean Wise’ restaurant (as recommended by the Vancouver Aquarium as an ocean-friendly seafood choice) too. Established for nine years, Chambar is a socially and environmentally responsible restaurant and are leaders in sustainability. Just for a diversion from my usual posts, I am going to provide my first critique of a restaurant experience I’ve had in Vancouver. On both occasions, I was greeted warmly on arrival and without fuss seated at our table. To commence the celebrations, a cocktail or two was in order and I promptly ordered a ‘Hogarth’s Mistake’. The name didn’t thrill me, however I have a penchant for gin and this was an earl grey infused gin complemented by Chambar’s house made cinnamon lemon syrup and orange zest. It was beautiful, served in a martini glass and the balance of flavours created a smooth and silky finish. It was an aperitif I could equally enjoy curled up on the sofa watching a favourite foreign film. I also sampled the ‘Veloso’ which was a perfect sip into summer with cachaca, passionfruit, plum and citrus. It was refreshing without the wow factor but still a great way to kick off the evening. Now on to the service, overall I felt it was just a bit lacklustre. I couldn’t put my finger on it but the sparkle and magic was definitely missing compared to my last visit. It was almost like we were invisible despite being seated right opposite a waiter’s station and the kitchen. Eventually staff noticed our requests and took our orders and refreshingly the kitchen restored the balance with prompt delivery of fresh and tasty food. As a starter, I preferred to choose a seafood dish. The Tartare de thon rouge was delicately presented on plate and the vibrant colour of the wasabi gazpacho was inviting. It was a sizzling refresher should I say and stimulated my palette to move straight to the petite crackers with tuna tartare. This was complemented by a crisp dry floral ‘arneis’ white wine from Langhe, Italy. On the previous visit, we had chosen the signature Moules Frites and also a duck main which is often a preferred option as I have a weakness for duck and other gamey meats. This particular evening, I had mentioned to one of our friends at the table that there had been an absence of our premium ‘Aussie lamb’ from my diet since we had arrived. When I sighted the Tajine d’aziza à l’agneau on the menu and discovered it was sourced from Australia, the desire to fight this choice was too strong. It was suitability impressive, with this highly fragrant lamb falling away piece by piece from the bone. The comforting pairing of honey, fig and cinnamon flavours put a smile on my face. A bowl of zalouk was served on the side; this is a delicious cooked salad generally made with eggplant, tomatoes, garlic, olive oil and spices. This addition ensured that this exotic dish remained savoury and not too sweet, finished off with a garnish of zesty cilantro/coriander. I always need to order some greens at the table and chose the asparagus, vincotto and parmesan side as well as the pommes frites. 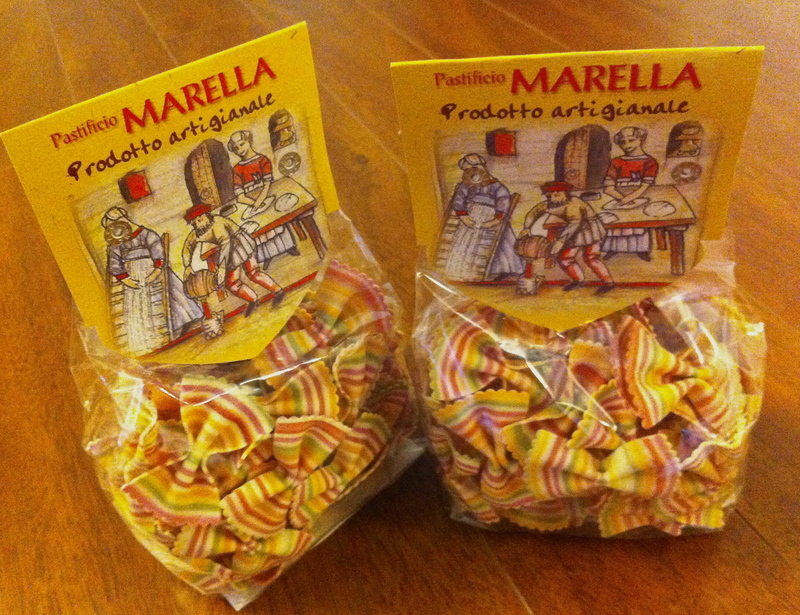 These as an accompaniment were a little disappointing and felt both could have been firmer and crunchier. 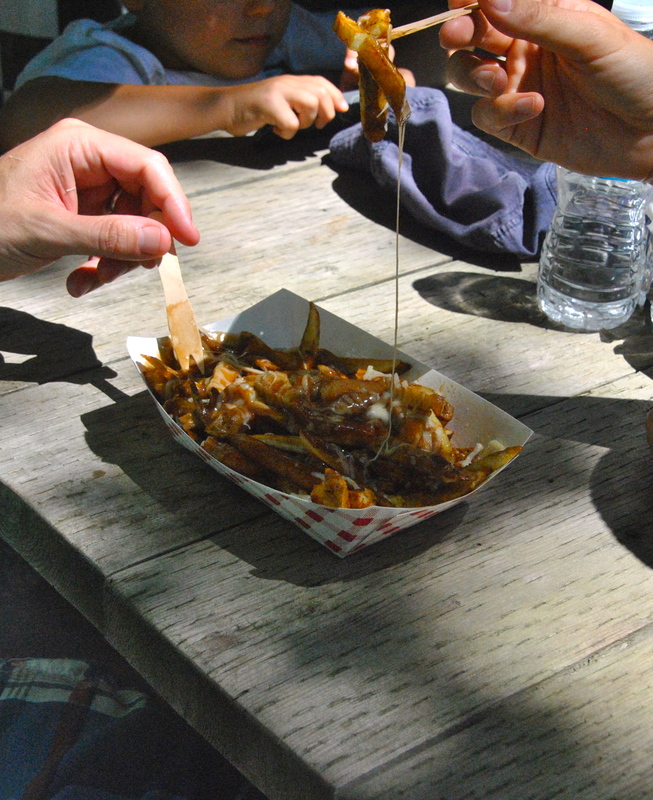 The pommes frites tasted like they needed a little less cooking fat to achieve this. After drinking a powerful red Van Zellers ’06 from Douro, Portugal I needed something adequately refreshing with a bit of punch. I shared a Tarte au Citron with my husband, which presented as a beautiful composition of a frozen lemon soufflé, coconut daquoise, toasted meringue and pie crust ice-cream. It had a good balance of textures, a luscious creaminess while still retaining a wonderful tang in this dessert. All in all I would recommend this restaurant to anyone wanting a fun night out with a satisfying choice and eclectic variety on the food and wine menu. I respect and admire a restaurant that is true to it’s philosophy of ‘non-pretentious fine dining’.